Prime Minister Narendra Modi on Thursday said even though India’s options have increased, Russia will remain the country’s “most important” defence partner as Moscow offered to fully manufacture in this country one of its most advanced helicopters. India and Russia also agreed to exploit the “unlimited” opportunities in defence cooperation as Modi held talks with visiting Russian President Vladimir Putin here. Noting that Russia has been India’s foremost defence partner through decades, Modi said his first visit outside Delhi as Prime Minister was to new aircraft carrier, INS Vikramaditya — a ship bought from Russia. “It sails our seas as a great symbol of our defence cooperation. Even as India’s options have increased on Thursday, Russia will remain our most important defence partner,” Modi said in his statement to the media after holding meeting with Putin here. The Prime Minister said Russia has been a pillar of strength for India’s development, security and international relations and both the countries discussed a broad range of new defence projects. “We also discussed how to align our defence relations to India’s own priorities, including Make in India. I am pleased that Russia has offered to fully manufacture in India one of its most advanced helicopters,” Modi said adding it can be used for both military and civilian use. “This will include the possibility of exports from India. We will follow up on this quickly,” Modi said. 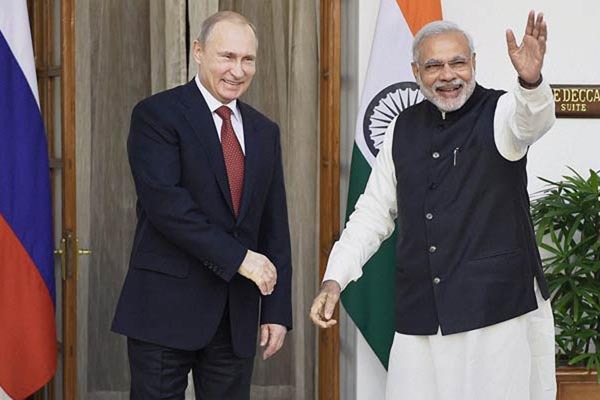 Modi said Putin responded “very positively” to the request.